Hans Christian Andersen once said that “to travel is to live”, but for baby boomers this quote should say “to travel in luxury, is to live”, as we shall reveal in this article. So why is Millennial the buzzword on the lips of the travel market in 2018? At every turn, the industry is trying to uncover what millennials want. The internet is brimming with advice as to how to appeal to this younger, social savvy target audience. At SkyClub, we feel this undivided attention is a tad misguided. The reality is that when it comes to travel, it’s the baby boomers holding down the fort. Baby boomers; with their grown-up children, retirement funds, and estimated 70% of a country’s disposable income are the perfect candidates for travel and play. What’s more is they are a prime audience for embracing elegant and comfortable travel that goes beyond the backpack and bungee jumping of their millennial counterparts. A study from AARP cited that 83% of boomers had specific travel schemes sewn into their futures and were much more concrete about plans than the more whimsical generation of millennials. Baby boomers are the doers not the dreamers, and the ones who will be seeking those tailored boutique experiences when travelling solo, or as a couple. Scratch beneath the surface and when it comes to travel, the two camps aren’t so different after all. 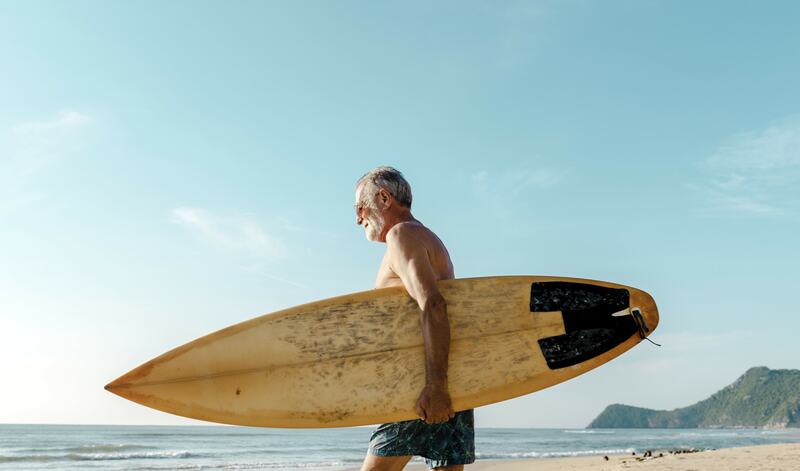 Times are changing and while millennials are putting off family planning and home ownership, baby boomers are also finding that they don’t have to conform to hackneyed stereotypes, and are free to embrace adventure and experience. The difference is, the boomers are more likely to have the financial resources and time to follow this path. Baby boomers have nothing to prove in the heady world of travel; in an age where health and wealth is on the rise, the 50 plus demographic is growing with it. While in the past; baby boomer travel would have been confined to cruise ships and all-inclusive resorts – times are a changing. 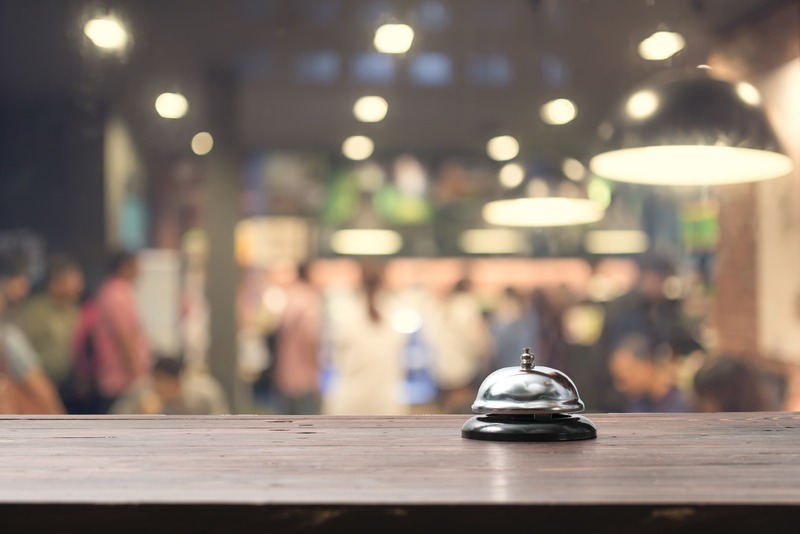 The growing appetite for tantalizing tours, trips outside the box, and a ‘to hell with it’ attitude should be causing the travel industry to sit up and take notice. When embracing the art of travel, baby boomers are also seeking those sublime new and exciting experiences. SkyClub recently conducted a customer survey on the future of travel and revealed that 27% of baby boomers travel to enjoy new experiences and 23% love to traverse the world in search of the finest food and culture. Fly and flop travel and family visits were still on that list of travel reasons, but the data is proof – the boomers also want to pad softly through the Taj Mahal, to sip fire scorched wines on the slopes of Mount Etna, and to take luxury treks through the dizzying heart of Peru’s Sacred Valley. In fact, SkyClub’s survey uncovered that the top three bucket list destinations for this demographic were a trip round the World, Australia and New York. For bucket list experiences the top trips to die for were Machu Picchu and the Inca trail, exploring the Galapagos Islands and trekking up various mountains. Interestingly, while millennials flock to Airbnb, only 10% of baby boomers said they would choose to stay in a local home as opposed to a hotel as pointed out by Dharma Home Suites. It appears that travelling baby boomers want the extra amenities, comfort and services that fit in with a luxury stay. As boomers are also more likely to choose travel for R&R, hotel stays slot nicely into that narrative. When you can order room service, have your pillows fluffed and head to the concierge desk to book a tour, why would you choose otherwise? Being less impressed by the constant Instagram feeds than the younger generation, baby boomers often know where they want to go before they sit down and plan their trip. Millennials are notorious for being influenced by social sharing when it comes to picking their next destination. As only 1% of baby boomers (AKA the silver surfers) have an Instagram account, they are less likely to be swayed by social media and will pick their destinations based on other factors. There are some major trends making a play for baby boomer travel, but the thread connecting the different styles of trip all seem to be based in luxury. In our research, we found that baby boomers are geared up to take 4.37 trips a year and a similar study from AARP suggested that only 23% had booked their international trips so far – leaving travel agents, tour companies, and those in the business lots of time to make an impression. When it comes to which destinations and vacation styles are luring baby boomers, it turns out there is no one size fits all. As we saw earlier, luxury treks up Machu Picchu are making a play for the attention of the older generation – but instead of sweating beneath a heavy backpack and camping, these tortuous trials are exchanged for porters and lodge stays. Historical travel is also making a splash; from Europe’s evocative piazzas to Petra’s rosy hues. Food walking tours are high on the list; from glitzy Spanish tapas to the pastel shades of the Cinque Terre. River cruises and soft adventure that deliver cultural cool are also alluring to the older travel market. Even though baby boomers share the same desires as millennials – to explore far and wide and to embrace those new experiences – they do practice the art of travel a little differently. These wise experience enthusiasts are more likely to take comfort and class into consideration and are also much savvier when it comes to pre-planning before leaving the home. Millennials tend to take a fly by your seat attitude – booking the cheapest seats and rocking up to random hostels. However, the boomers are more likely to desire a business class ticket, a boutique bed and are more willing to splash out on those lavish details to make their stay more memorable. The majority of baby boomers also prefer to sail through the skies, as 87% declared air travel was their most anticipated mode of transport when heading out on vacation. Many baby boomers are drawn to luxury travel, however that doesn’t mean they are free from wanting a good deal. In SkyClub’s survey, it was revealed that 56% of baby boomers chose to fly business class in the past 12 months. The same survey also uncovered that for 31% of travellers in this age bracket, price was the key consideration when booking their ticket. So while boomers are more likely to book that bespoke wine tour or upgrade to a first class ticket because they aren’t as concerned about the budget – they still want to know they have found the best deal. Even though they may not have their own Snapchat and Instagram feeds, baby boomers are still tech savvy; well versed in using the internet, with a nose for a good deal, they will research the best travel deals using flight and hotel comparison sites. However, even though baby boomers will utilize technology to find a deal, they still prefer a person-to-person service. Only 21% of baby boomers said they would prefer to book a first or business class flight online. This comes as no surprise for a generation that veers towards peace of mind when spending their hard earned money and wanting the personal touch that luxury travel can bring. 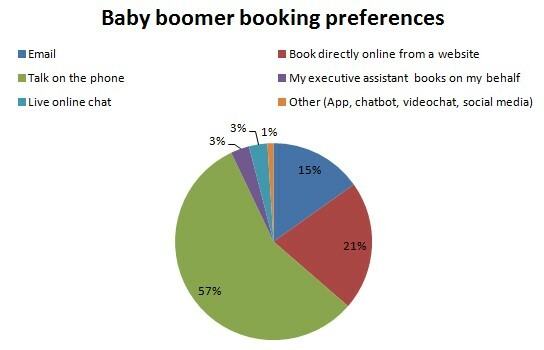 Interestingly, in the internet age, the majority still prefer to book over the ‘phone with an agent as shown in the pie chart below. While the desire to snap up the millennial market has been paving the way recently, the travel industry shouldn’t write off the plus 50 crowd. With lashings of disposable income, a thirst for an experience, and a preference to make their travel life more comfortable; boomers will continue to drive and perfect the art of luxury travel, and have a ruddy good time along the way. 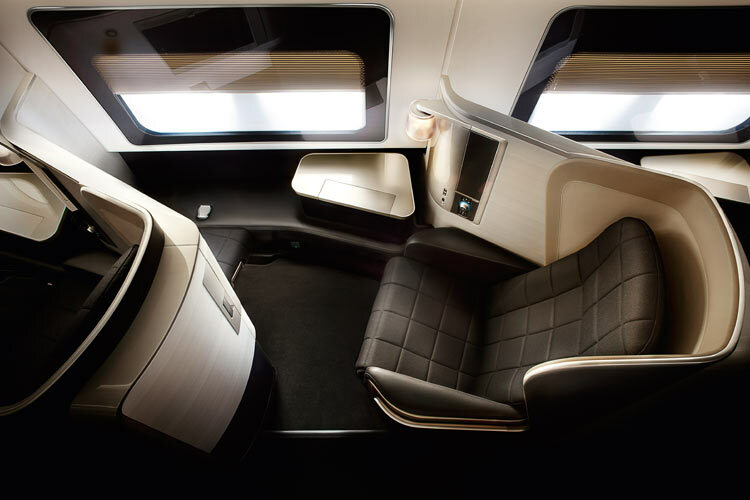 If you are considering your next luxury travel experience then simply enter your details into the form on this page and SkyClub will find you the best priced first or business class flight to your desired destination. SkyClub also specialises in crafting bespoke bucket list holidays, so do call one of our agents on +442072551234 and we will help you design the luxury experience of a lifetime.